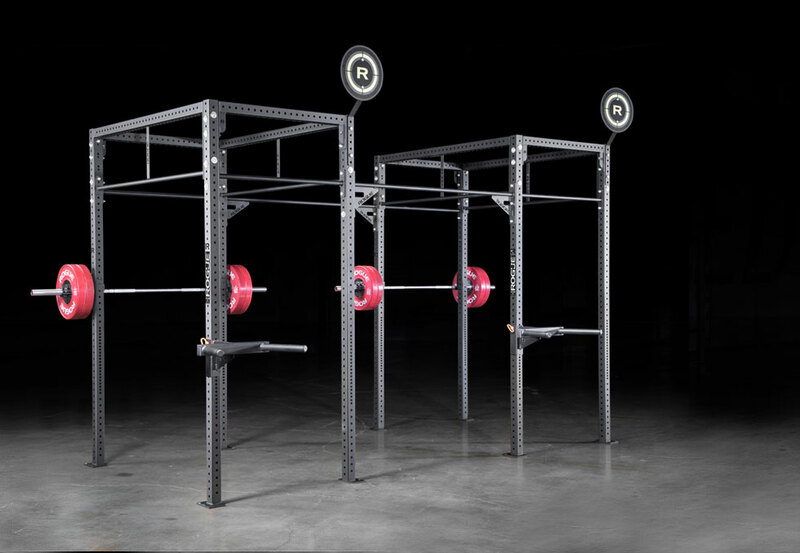 The Base Edition of the Rogue Monster Lite Rig 2.0 maintains the specs of the original model, with 3x3” 11-gauge steel uprights, 5/8” holes, and a combination of X-43 and X-70 crossmembers. It’s a versatile variation on the heavy-duty Monster Rig that offers full compatibility with Infinity Series crossmembers. 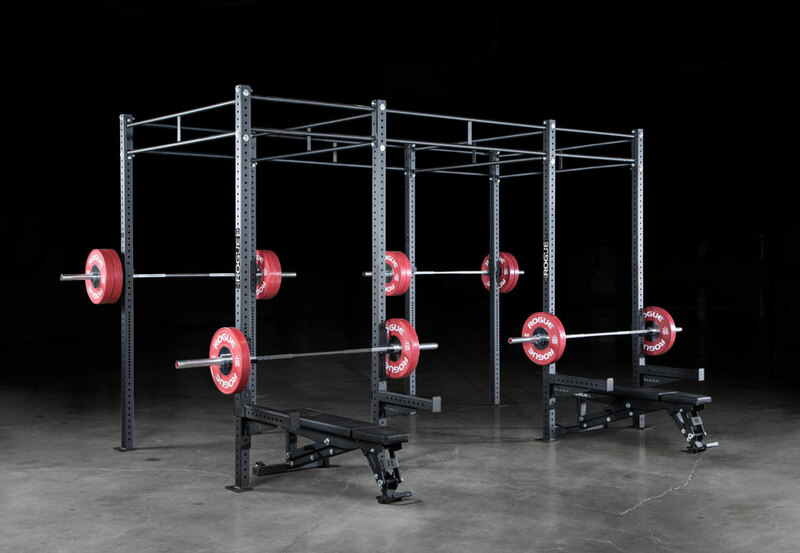 The Monster Lite Rig is manufactured in Columbus, OH, and designed with infinite customization options in mind. 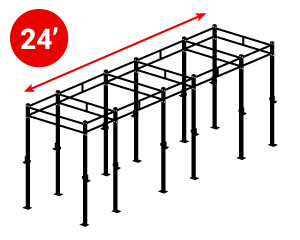 Available in four standard lengths (10’, 14’, 20’, 24’), the unit can be expanded by 4’ and 6’ sections and is compatible with a broad range of accessories, including Monster Lite Plate Storage Posts, Safety Spotter Arms, the Matador, and more. 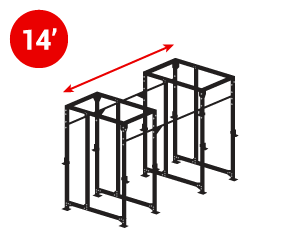 Well suited to garage gyms and large-scale training facilities, a standard-size Monster Lite Rig can instantly create between 2 and 6 squat/bench stations and 6-14 pull-up stations (see sizing breakdown below). 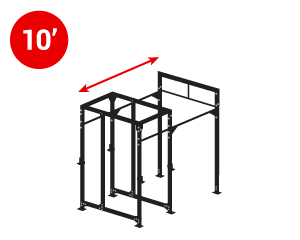 The system includes fully adjustable pull-up bars (with optional Dirty South Bar), all necessary Black Zinc 5/8” bolts and fasteners, Monster Lite J-cups, and 9-foot uprights.Original Black Powdercoat comes with Bright Zinc 5/8” bolts and fasteners. 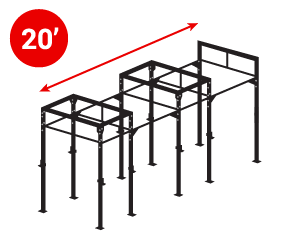 With the Standard Edition of the fully redesigned Rogue Monster Lite Rig 2.0, we’ve introduced several key new features, including 3x3” beams across the top for an increased stiffness, 2” hole spacing on the outside of the uprights (allowing more attachment options), and single pull-up bars for both the 4’ and 6’ sections. The core elements of the unit remain the same—with 3x3” 11-gauge steel uprights and 5/8” holes creating a perfect hybrid of our Monster and Infinity Series rigs. 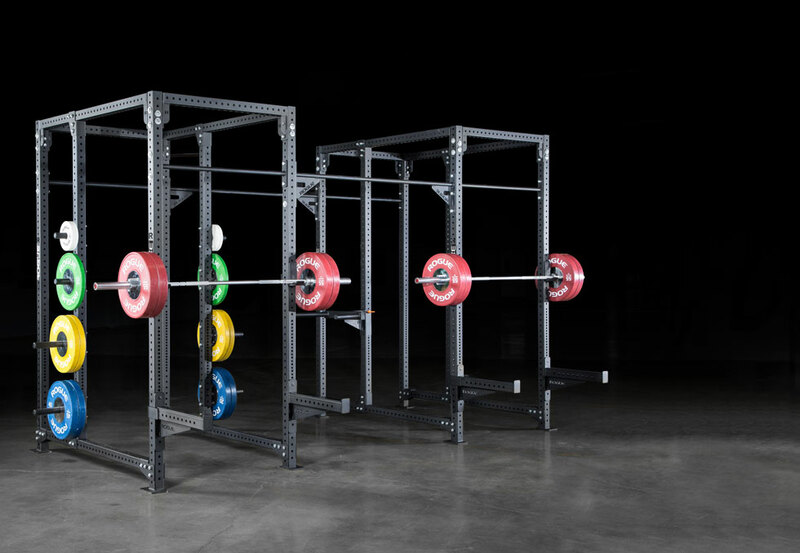 The Monster Lite Rig 2.0 is manufactured in Columbus, OH, and designed with infinite customization options in mind. 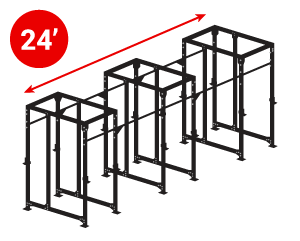 Available in four standard lengths (10’, 14’, 20’, 24’), the unit can be continuously expanded by 4’ and 6’ sections and is compatible with a broad range of accessories, including Monster Lite Plate Storage Posts, Safety Spotter Arms, the Matador, and more. 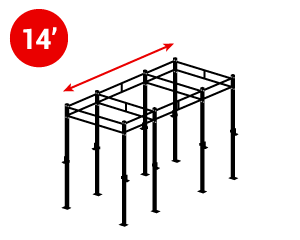 Well suited to garage gyms and large-scale training facilities, a standard-size Monster Lite Rig can instantly create between 2 and 6 squat/bench stations and 6-14 pull-up stations (see sizing breakdown below). 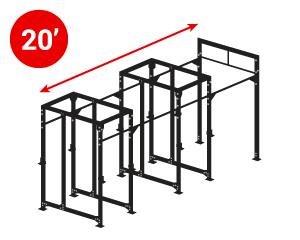 The updated 70” single pull-up bar in each 6-foot section now features pass-through construction, meaning the bar continues directly into the endplate for optimal stability and safety. The rig also ships with all necessary Black Zinc 5/8” bolts and fasteners, Monster Lite J-cups, and 9-foot uprights. Original Black Powdercoat comes with Bright Zinc 5/8” bolts and fasteners. Important: Unit must be bolted to the floor. Black Zinc 5/8” bolts and fasteners.Original Black Powdercoat comes with Bright Zinc 5/8” bolts and fasteners. The Monster Lite Rig 2.0 is manufactured in Columbus, OH, and designed with limitless customization options in mind. 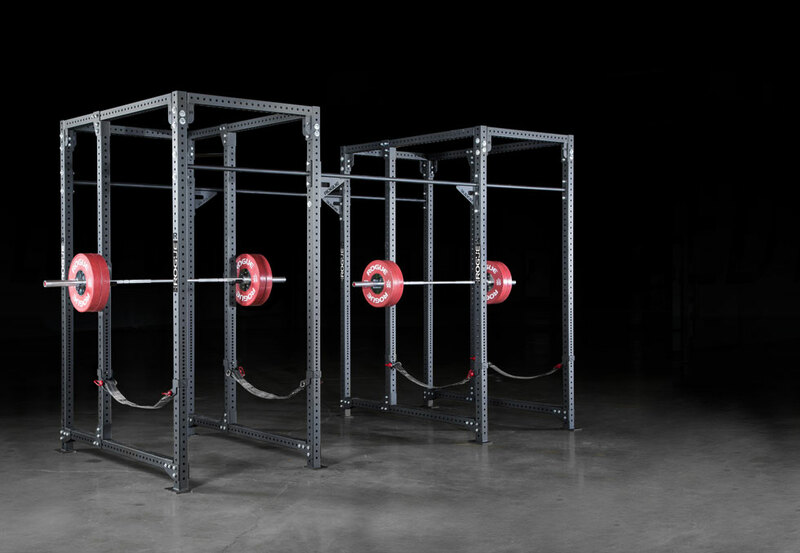 Available in four standard lengths (10’, 14’, 20’, 24’), the unit can be expanded continuously by 4’ and 6’ sections and is compatible with a broad range of accessories, including Monster Lite Plate Storage Posts, Safety Spotter Arms, the Matador, and more. 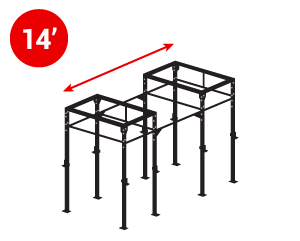 Well suited to garage gyms and large-scale training facilities, a Monster Lite Rig can instantly create 2-6 squat/bench stations and 6-14 pull-up stations (see sizing breakdown below). 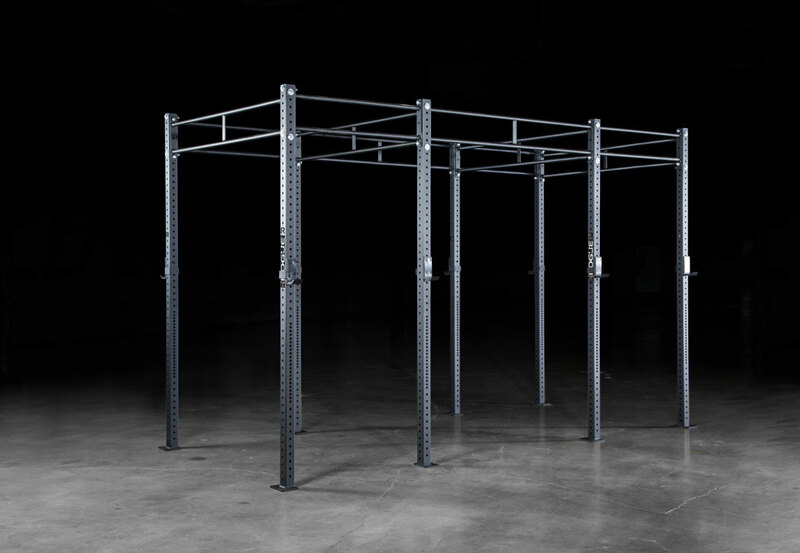 The Racked Edition ships with adjustable single pull-up bars (Dirty South Bars also available), all necessary 5/8” hardware, Monster Lite J-cups, and your choice of 9-foot or 12-foot uprights. 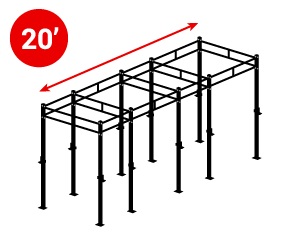 Please Note: Depending on whether a Racked Monster Lite Rig terminates in a 4' rack section or a 6' pull-up section, the 70" beam spanning the depth of the rig will differ slightly. 14' and 24' Rigs: These rigs end in rack sections on both ends. 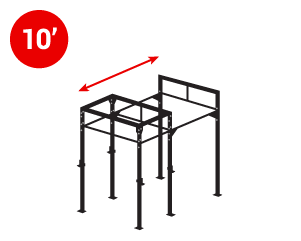 As a result, the tops of both ends terminate in 70" beams with gussets, allowing for the attachment of the drop-in upright. 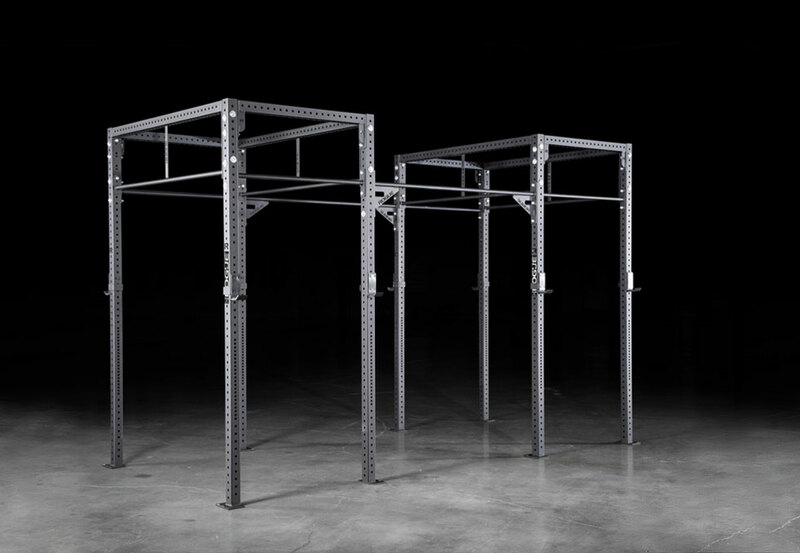 10' and 20' Rigs: These rigs terminate in a rack section on one end and a 6' pull-up section on the other end, so the 6' section includes a 70" beam with an attached pull-up bar (rather than gussets) to maximize the included pull-up positions. Monster Lite Rig 2.0 is rated 5.0 out of 5 by 5. Rated 5 out of 5 by Warninger from Fantastic Piece of Equipment Purchased this for my Physical Therapy Office, highest quality piece of exercise equipment i have ever purchased. Rated 5 out of 5 by Trock from Beautiful center piece of the business. Beautifully made, I wanted a rig that would stand out and meet all the needs of our community. Rated 5 out of 5 by Coach Ugly from Absolutely Brilliant! 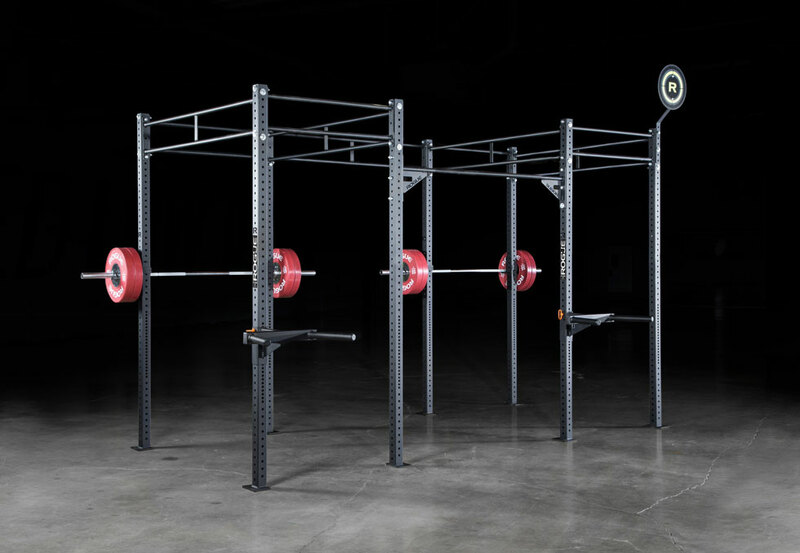 I left my garage gym to have my own commercial Performance Training Gym and purchased this Rig to be the Center Piece of my dream facility. Well it has yet to disappoint. 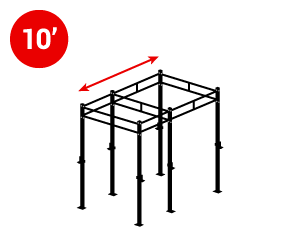 Extremely Sturdy! Anchor it and it's as steady as a Steele fortress! 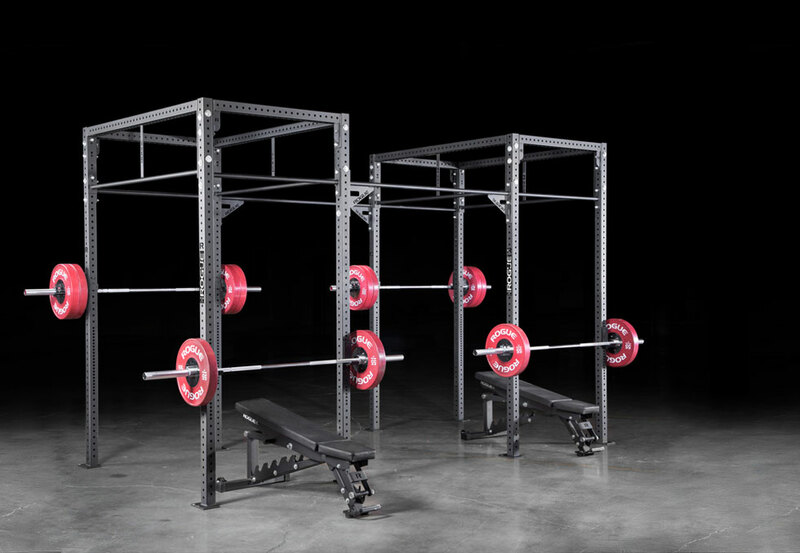 I purchased the adjustable monolifts, some benches, and Bella. My clients and perspective clients always rave about it's beauty and functionality. I've had an entire AAU basketball team on my 14 footer doing jump pull ups at the same time and it didn't budge. 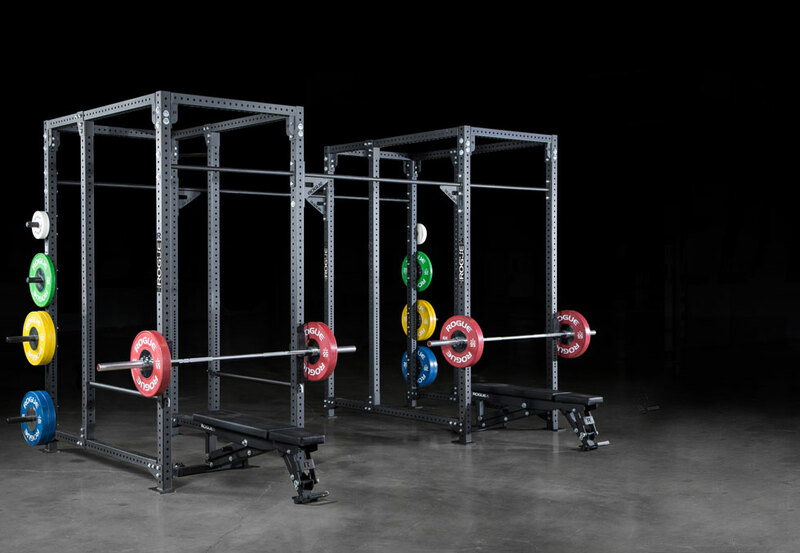 It's great for the super sets like squats to bench etc and doesn't take up much room while providing some valuable uses. Rated 5 out of 5 by PEich from Freaking love this thing! One year into our new space and this rig is the centerpiece, so much more stable than infinity!